In general, terminals that are compatible with EMV will allow a business to accept credit cards that are associated with Europay, MasterCard and Visa, and the devices can process cards that feature cutting-edge chips with encrypted information. Known as smart cards, the credit cards will still have magnetic stripes, and some of the credit cards feature components that provide radio frequencies, which will allow EMV terminals to scan cards that are situated within 8 inches of the devices. The technology may decrease the risk of fraud and could prevent anyone from copying a card’s information. By installing EMV terminals, a business can increase conversion rates, boost sales, eliminate liability for financial losses that could be caused by fraud, accept cards that are linked to mobile devices and allow customers to make purchases more rapidly. The standard was initially developed during 1993, and in 2005, regulatory agencies in the European Union mandated the use of EMV. By 2012, most cards in Canada featured the cutting-edge chips. Throughout the United States, financial institutions had provided more than 20 million cards that utilized the standard’s technology by January 2014. So far, financial institutions have issued more than 600 million credit cards that are related to EMV throughout the world, and during July 2016, 65 percent of new credit cards were compatible with EMV. By October 2015, more than three million customers had cards that contained cutting-edge chips, and during 2015, at least 33 percent of credit card transactions were associated with smart cards. As of October 1, 2015, a business may be liable for fraud that could be committed by customers who use EMV unless the company has terminals that are compatible with EMV. By installing EMV terminals and accepting cards that have microprocessors, all companies can entirely eliminate liability for fraud. During the last two months, MasterCard transferred liability to companies that provide ATMs that are not specifically designed for EMV. Recently, other financial institutions also indicated that the technology could increase the widespread usage of ATMs. On October 1, 2017, several large enterprises that offer credit cards will require companies to pay the financial costs of fraud that occurs at gas pumps without terminals that meet the standards of EMV. Moreover, Visa will shift liability to companies that offer ATMs that are not designed for smart cards. By installing EMV terminals, a business owner can receive payments from contactless credit cards, complete online transactions that are protected by cryptograms, receive payments from mobile devices and process cards that generate electromagnetic fields. Likewise, the company may sometimes accept payments from devices that are linked to USB cables. Each state-of-the-art card has a circuit that holds the card’s information, and this integrated circuit allows the smart card to provide data even if the magnetic stripe has become damaged. The card’s internal circuit is resistant to moisture and scratches. Unlike many traditional cards, the component will not typically be damaged if a customer severely bends the credit card. If a company uses devices that scan contactless credit cards, the vendor will enter the transaction’s information before a customer places the smart card near the scanner. The device automatically records the card’s information and completes the transaction. According to one analysis, more than 52 percent of credit card terminals will likely feature the scanners by 2023. When utilizing a smart card that emits radio frequencies, a customer will not have to remove the card from a wallet. Instead, the buyer may place a compatible mobile device near the terminal, and the equipment will automatically analyze the card’s information and process the payment. A detailed survey showed that approximately 60 percent of customers would prefer to make payments by positioning their mobile devices near terminals. An associated report indicated that the technology could increase a company’s sales by more than 9 percent. During the 1990s, most businesses installed terminals that could automatically communicate with the computers of the companies that provided the credit cards. This technology substantially accelerated the process of completing sales, yet before swiping a card at a terminal, a company’s representatives could quickly insert the credit card into a machine that automatically copied the card’s information. These devices were commonly used at restaurants because representatives would manually carry the cards to terminals, and typically, customers would not actually observe the terminal during the transaction. In 2002, some individuals began to place small scanners on ATMs. The compact devices could store each credit card’s information when a customer inserted a card into the ATM. In general, the devices are not able to copy a card with a cutting-edge chip. Each chip’s microprocessor typically features a distinct type of encryption. Therefore, the information may not be deciphered, and when issuing a new card, a financial institution can typically modify the customer’s cryptogram. When offering merchant services, many businesses now provide tablets that can process smart cards and standard credit cards. These devices allow an organization to accept payments from clients who attend fundraisers, visit construction sites and request services at an off-site location, and the tablets give a company the ability to process payments from patrons who call the business. While a client places orders online, each card’s unique cryptogram will prevent anyone from manually copying the smart card’s information. A recent report showed that the technology could augment the number of online customers by more than 14 percent. Once a company has installed EMV terminals, the business may increase its monthly sales, boost the conversion rates of the company’s website, augment the percentage of customers who make multiple purchases, increase the average price of sales and boost the percentage of patrons who store billing information on the company’s website. Furthermore, the up-to-date devices are able to substantially increase the amount of orders that an entrepreneur can process during each hour. In November 2016, more than 35 percent of businesses are able to accept cards that are associated with EMV, and one report showed that approximately 82 percent of companies will have terminals that are compatible with EMV by 2021. If a business does not utilize an EMV terminal, customers may not feel secure when buying products. Therefore, business owners who do not install EMV terminals may unknowingly lose patrons who have worries that are associated with a card’s security. According to one report, more than 78 percent of credit cards will likely meet the guidelines of EMV by 2023. A survey indicated that 68 percent of customers were more likely to shop at a store with terminals that are compatible with EMV. The analysis also showed that 14 percent of potential buyers may avoid stores and companies that do not have EMV terminals. A detailed report suggested that more than 22 percent of chargebacks were associated with potentially fraudulent cards, and approximately 8 percent of completed returns are partially due to credit cards that have been used by individuals who are not the cardholders. By 2023, EMV terminals could reduce the amount of chargebacks by at least 14 percent. An extensive analysis suggested that EMV may increase the median number of products that buyers purchase, and the technology can boost the average revenue that sales provide. By improving feelings that are associated with security, the technology might also raise the percentage of patrons who refer friends to companies that use EMV terminals. Throughout Europe, the prevalence of devices that feature EMV is much greater than the overall use of the terminals in the United States, and during the last two years, the number of EMV terminals in South America has increased by at least 35 percent. In 2015, the devices successfully completed more than 95 percent of international transactions that are related to smart cards. Typically, a business owner can easily connect the terminals to software that has been produced by Intuit Inc., and consequently, the terminals will automatically indicate the number of daily sales, the company’s revenue, the amount of items that customers return, the number of products that each client purchases and the subtotal of every sale. Moreover, the software programs can automatically determine the amount of customers who request refunds. 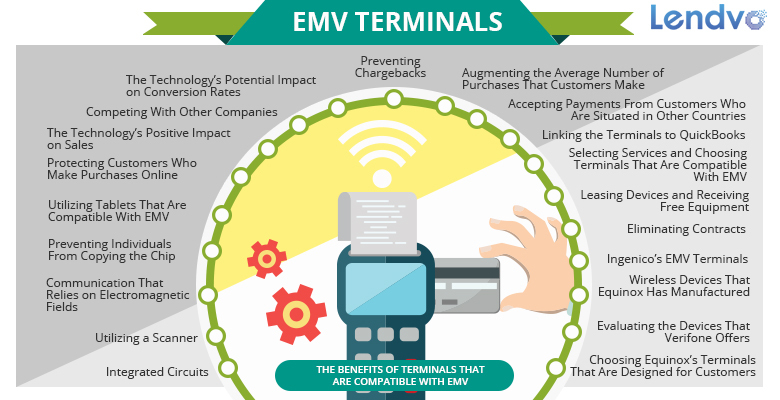 When choosing an EMV terminal, an entrepreneur may evaluate components that can scan contactless cards, parts that may provide images of a customer’s signature, the speed of each device’s connectivity, the equipment’s compatibility with USB cables and components that print receipts. Before purchasing a new terminal, a business owner should ensure that the device has been unlocked. If the equipment is still locked, the device will only be compatible with specific types of processors and services from a relatively small number of businesses. When providing payment processing services, many businesses allow merchants to lease terminals and other types of equipment. Moreover, an analysis showed that approximately 30 percent of service providers will offer a free terminal to vendors who choose the company’s service packages. According to one report, more than 59 percent of companies that offer EMV terminals will not require a merchant to sign a contract. Likewise, many businesses will provide various accessories, such as devices that print receipts, USB cables, chargers, durable mounts, keypads and overlays. Equipped with a screen that has a size of 4.3 inches, this terminal features numerous lanes and is able to store 2,000 images that show the signatures of customers. Unlike many terminals, the device may receive payments from customers who are using Wi-Fi, Bluetooth or a smartphone that is linked to a USB cord. The EMV terminal can also accept payments from mobile devices that use General Packet Radio Service, which is a trademarked technology that can transfer data at a rate of at least 56 kilobytes per second. In general, this customer-facing terminal is able to increase the number of additional purchases that a patron makes while the buyer is preparing to swipe a credit card. Additionally, a report showed that this type of device may boost the average price of a company’s sales by around 8 percent. Equinox’s terminal has a large LED and is compatible with a detachable charger. The device can receive payments from credit cards that follow the guidelines of EMV or cards that solely use magnetic stripes. The sizable device allows customers to privately enter a personal identification number, and the terminal is able to swiftly print receipts. The equipment can also be linked to modems that use a dial-up connection. This customer-facing terminal has a touch screen that may feature advertisements from merchants, promotional codes and instructions that can accelerate the steps of each sale. The device may also provide audio that is associated with information that the screen offers. The terminal can receive payments from cards that use EMV, magnetic stripes, USB cords and distinctive cables that Verifone manufactures. A business owner may upgrade this EMV terminal by installing a component that can analyze electromagnetic fields. Equinox provides an advanced terminal that can accept smart cards, credit cards that only use magnetic stripes and cards with components that emit radio frequencies. Furthermore, the terminal allows businesses to accept payments by utilizing a USB cable. The terminal’s screen features a size of 4.3 inches, and the device is equipped with a backlight that illuminates the keypad. The equipment lets a customer enter a personal identification number and features components that can automatically create an image of the patron’s signature. The device also has an audio jack and a high-quality speaker.